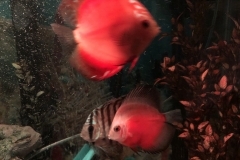 The good news is that unlike many other Cichlids, Flowerhorn will usually not eat their eggs. 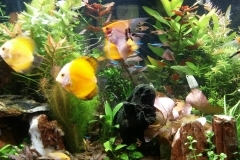 They will display other common post spawn activities that many Cichlids display. The female will take up a position above the eggs and will constantly mouth the eggs. The purpose of this is to get rid of any eggs that are infertile and to keep fungus from forming on the eggs. She will defend the eggs with her life. If you put your hand in the tank near the eggs at this time, she will viciously attack it (and it will hurt). Most of the time she will chase the male away from being directly above the eggs, but not always. It can vary depending on the pair. The male will usually stay near the eggs guarding against any other threats. Once again, if you put your hand in the tank, even on the other end, the male will attack it. While the male and female will often show some aggressive behavior towards each other, they will not usually do any actual damage to each other while there are viable eggs. You can feed them pair while there are eggs without any worry that it will stimulate the to eat the eggs. They will eat while they guard the eggs. 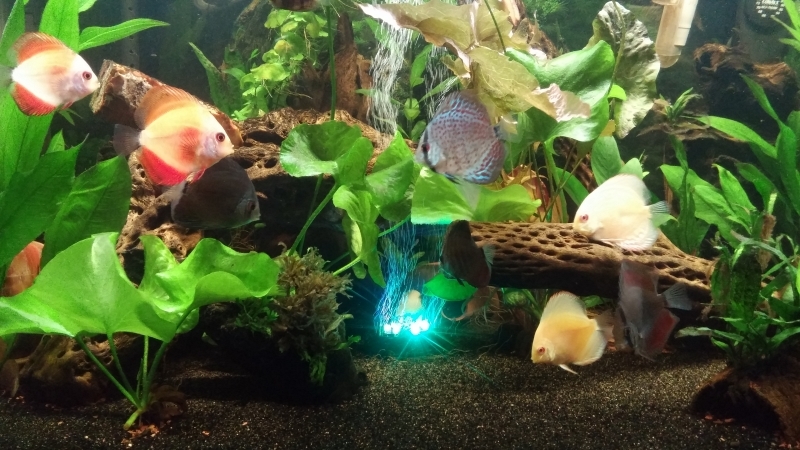 Last month we went over breeding tank set up, this month we will go over getting a pair. You will find that the triggers for getting Flowerhorn are pretty much the same as other Cichlids. Once they go into pre spawning mode, the fighting will decrease, but rough mating will start. 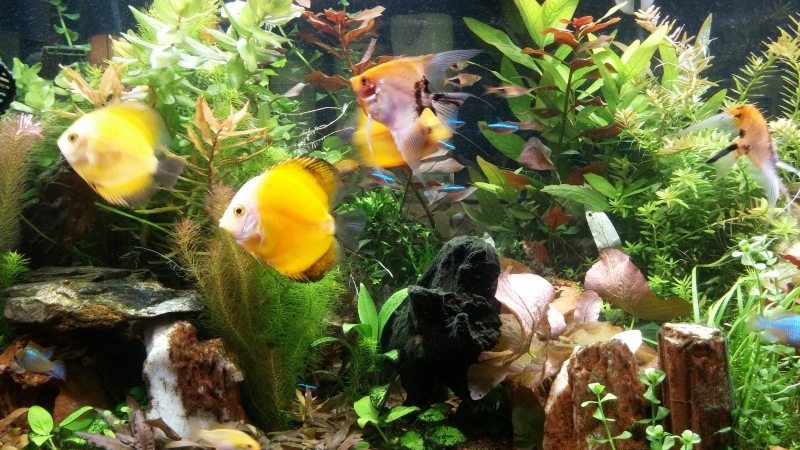 The technique that works the best is hard for most of us aquarist to do, as it goes against everything we strive to accomplish with our aquariums. With that said, it works and does not hurt your Flowerhorn in the long run. This will conclude our series on breeding discus. Growing out fry requires very little work on your part. The parents do all of the work for you. Discus fry eat the slime off the parent’s side for the first 10 days to two weeks. This slime is very high in protein and contains antibodies that help the babies fight off disease. 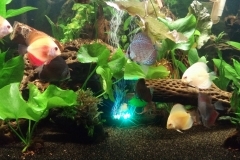 Once the fry become free swimming, they will instinctively go to the sides of the parents to feed. They will go back and forth, usually in groups between the male and female parents. They do not show a preference for the father or mother. 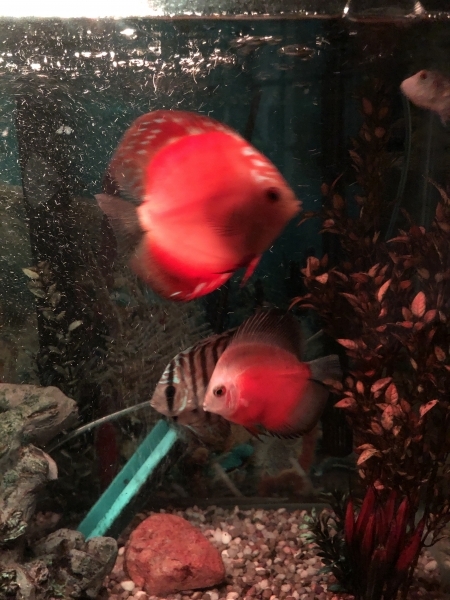 There is nothing more beautiful in the fish world than a pair of discus, in full spawning coloration, swimming with a school of small babies at their side. Things you should remember. First, these babies will be very small and weak, so you will need to turn off all filtration, except for a sponge filter. The biggest mistake that you can make is to do a water change in this aquarium with water that is not EXACTLY the same temperature. 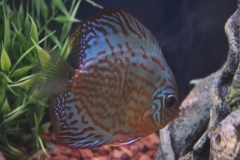 Discus fry are extremely sensitive to temperature shock and will die if you do a water change with water that is more than a few degrees different in temperature. 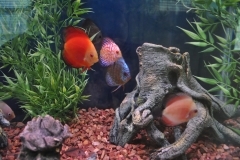 With that said, discus fry are also very sensitive to ammonia burn, so you will need to do daily partial water changes. We like to keep our grow out discus tanks, until they reach about 1.5 inches, at a temperature of 88 degrees, as the high temperature increases their metabolism and speeds up growth. Previously we went over how to artificially raise the fry. Now we will go over raising the fry naturally. Next we will go over growing out the baby discus. Growing out fry requires very little work on your part. The parents do all of the work for you. Unfortunately, it is very common for the parents to eat the babies, so most breeders artificially raise the fry. There are advantages to naturally raising the fry over and above that it is much easier. Discus fry eat the slime off the parent’s side for the first 10 days to two weeks. This slime is very high in protein and contains antibodies that help the babies fight off disease. Naturally raised fry will grow much faster at first and will have more resistance to disease throughout their lives. Once the fry become free swimming, they will instinctively go to the sides of the parents to feed. They will go back and forth, usually in groups between the male and female parents. They do not show a preference for father or mother. 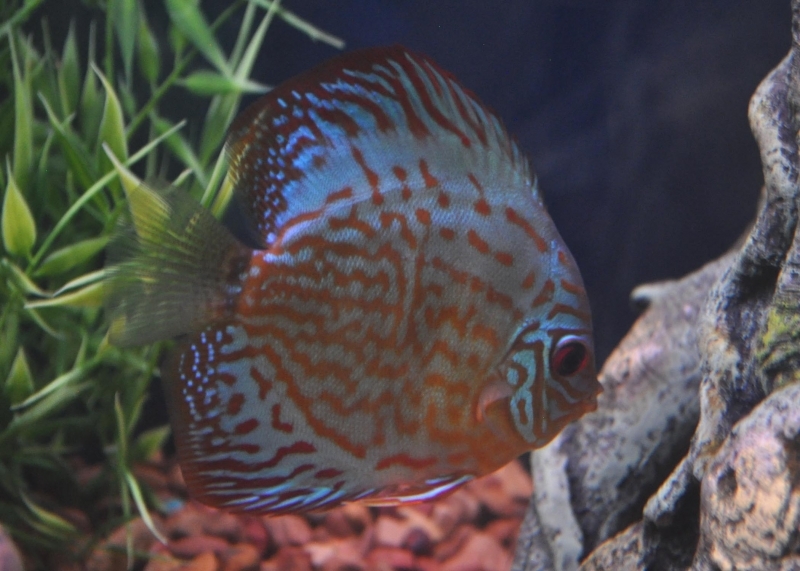 There is nothing more beautiful in the fish world than a pair of discus, in full spawning coloration, swimming with a school of small babies at their side.